The base for the design was the desire to create a free unrestricted access to knowledge and information, as well as a collaborative and cooperative management and decision making process with emphasis on the right to see the operations and activities of government at work. This supports government accountability and helps protect other necessary rights. 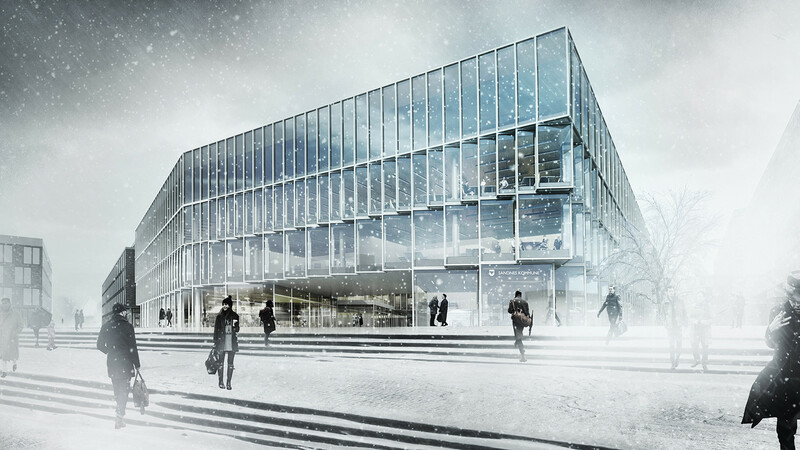 The new City Hall of Sandnes would celebrate the concept of openness and transparency. Designed as a welcoming house which is as accessible as possible to it’s citizens and a building that lives up to the highest requirements for a modern, efficient and flexible office space. The volume required by the program would be adapted to the local urban conditions and modified to create connections with the surrounding area and bring the inhabitants closer to the city officials and their decision making process in the spirit of true participation. 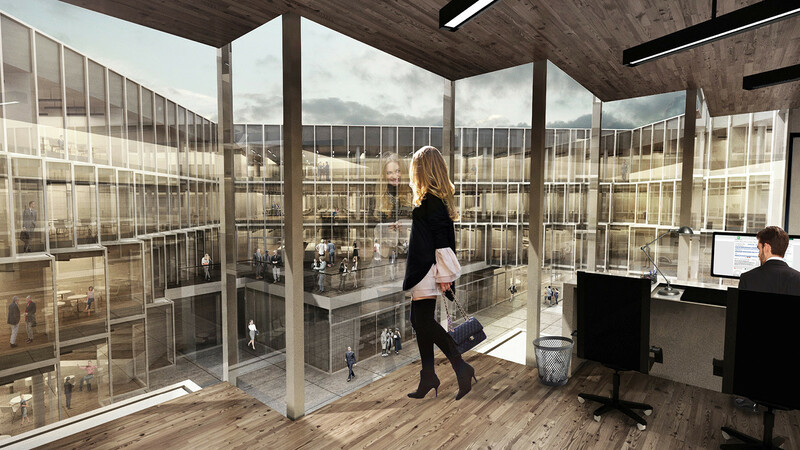 With all the office spaces continuously facing the streets a courtyard is created which would be the central area of the whole Havneparken masterplan. Walking and biking, crisscrossing from the streets, would be encouraged to reach the water promenade, creating a vibrant district for pedestrians and cyclists. The importance of the building in the area would be emphasized by it’s architectural exterior design where past tradition would be commemorated with a modern dynamic and universal outlook. The building contains mainly of the assembly hall, administration, and citizen services. 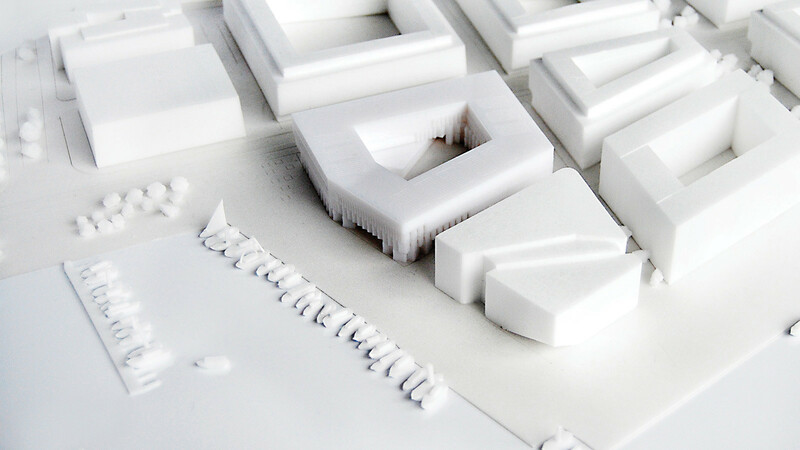 The program is distributed in a 4 story building with an open-air atrium and a block separated from the rest of the office area, containing the semi-public program like exhibition space with the physical model of the city of Sandnes, a gallery, meeting spaces and a cafeteria. 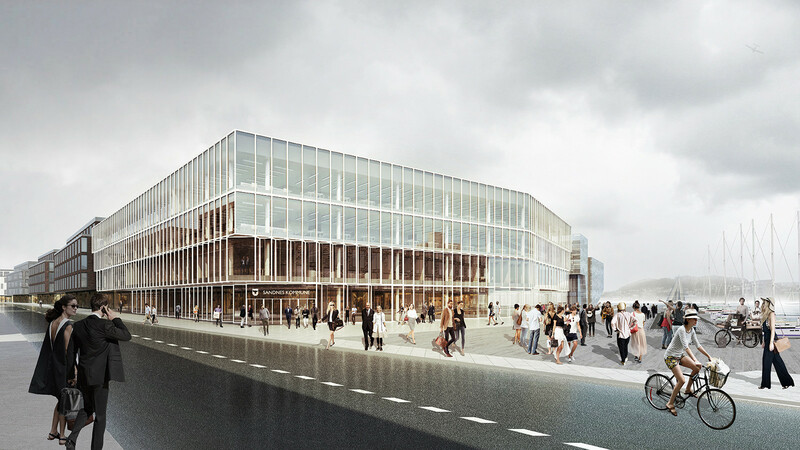 The new City Hall will be user friendly and easy to use for both employees and the public which will be able to move in the building reaching every destination efficiently with its vertical connections and service spaces. 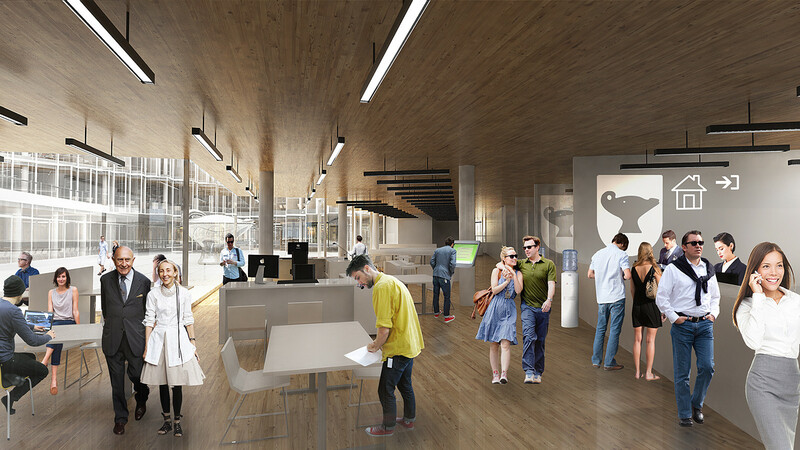 The first floor will be mainly reserved for public-oriented functions, such as a spacious citizen service center available from the street level. 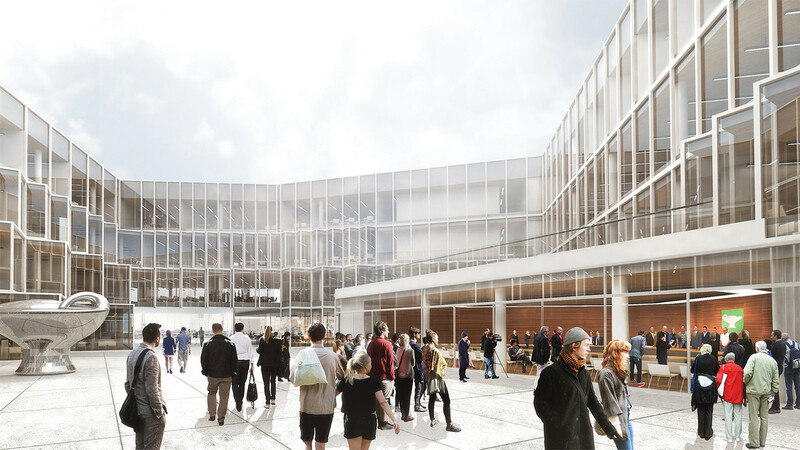 The upper floor would be semi-accessible, where atrium oriented meeting rooms would be present with enriched view connections. The outer part of the ring on this and next levels would be devoted to highly adaptable office spaces flexible enough to challenge in a low cost manner, changing organisational conditions regarding the prognosed transition to parliamentary rule or more simple departments’ customisations. A resistant structural system, roof and top floor design together with an optimal vertical communication, would additionally take into account any future floor. 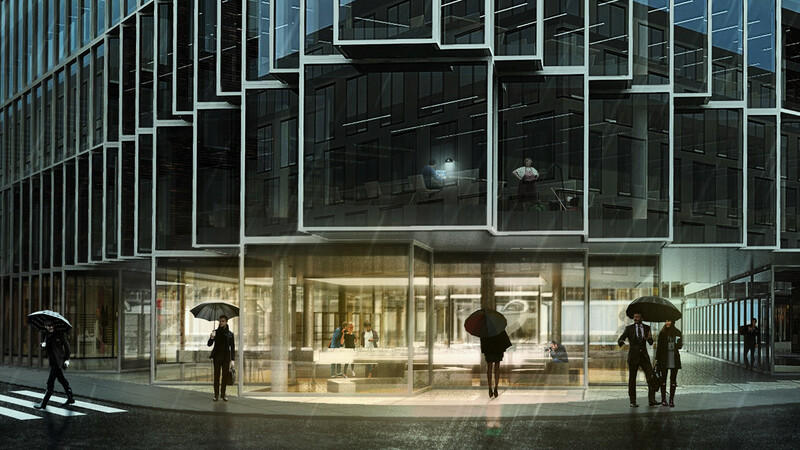 The landscape of Havneparken is an integrated part of the building where the urban space would carve through the office block creating a public passage linking important diverse areas to ensure a good micro-climate and making service zones easily accessible. Together with social attractors, public and audience-friendly features positioned at the first floor level which would invite citizens to cross the building, they would be experienced through recreation. 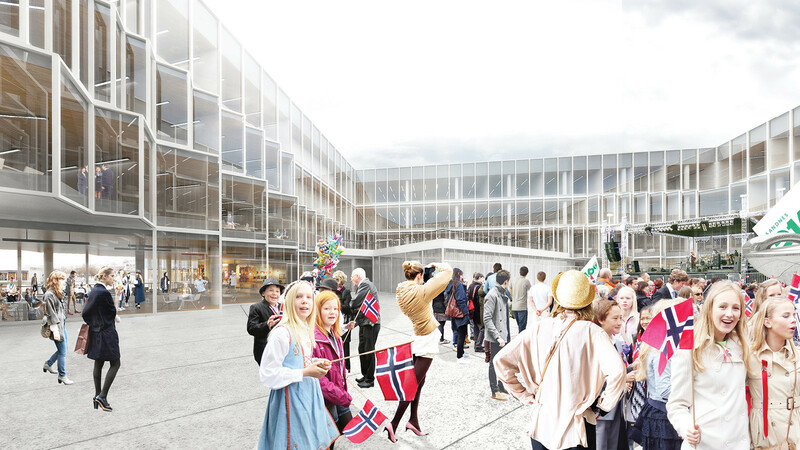 After hours on evenings the ground level facades with the canteen accessible for both employees and citizens and a room exhibiting the physical model of Sandnes dedicated to inform about the city, would entirely open towards the inside of the plaza adding a desired ambient and a social quality. An important public feature located in its center would be the assembly hall which fulfilling the goal of social quality would be accessible for public hearings and proceedings of the government and could be opened on special occasions enforcing an effective public oversight. The middle of the plot would be a sunny stay zone with a potential to host various public events for all ages and user groups, such as cultural events or markets. 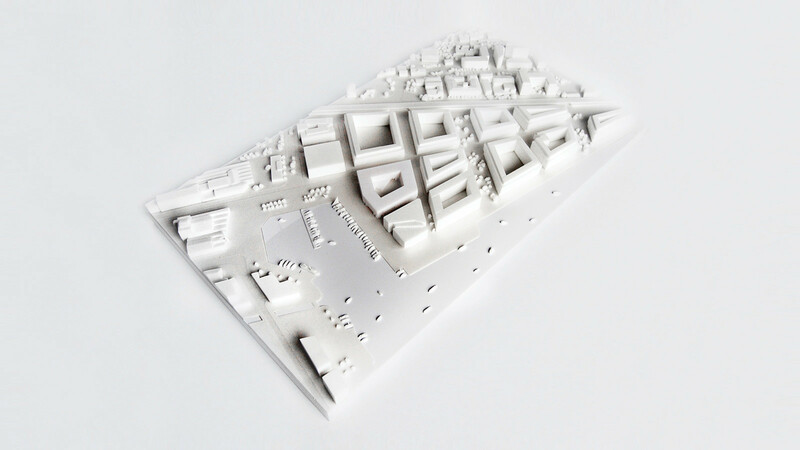 The flat roofed courtyard block volume of the city hall would blend in the dense urban newly designed surrounding. The facade walls would continue the building limit lines with the 1st floor pushed back from Elvegata to create a spacious arcade area for pedestrians. The main structural system with large spans would allow a flexible design. Prefab construction elements would reduce the construction time. The building would have 3 structural elements: the cores with vertical communication and services, columns, the structural facade and post tensioned concrete floor slabs. To create a rigid structure piling would be used in the foundations. The facade design would give context to the area without being monotonous. 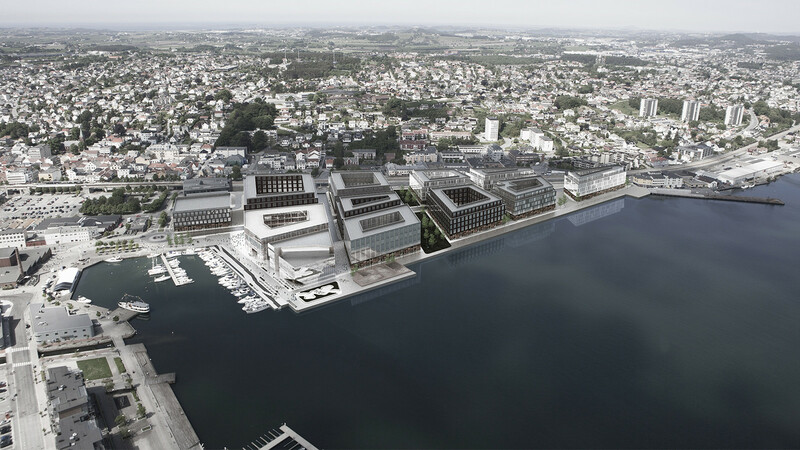 The office elevation module would be transformed to create more views, attract by-passers, improve light conditions and direct the visitors straight to the harbour. 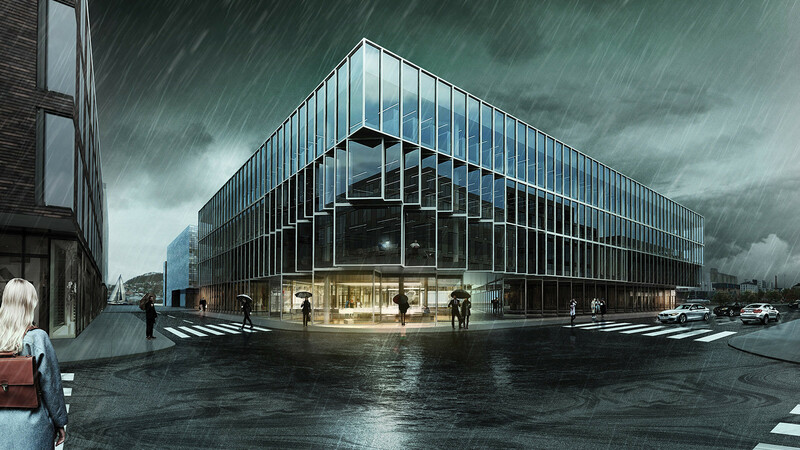 The building would stand out in a subtle manner in the quarter through the choice of color and materials. A glazed office curtain wall outlined with a white painted metal framing, would be an energy-efficient solution during construction work and present a long life and low maintenance cost after it’s erection. Considering the Life Cycle of Cost, effective solutions in relation to the specified budget would be strengthen with the use of local materials, including recycled wood in all possible internal surfaces creating a warm ambient visible already from outside from a distance. The town hall was designed according to the passive house standards introducing sustainability on several levels of the design, to boost energy saving and to reduce the buildings footprint impact including a compact solid, integrated accumulative materials, the re-use of rain and waste water, harvesting solar energy with PVC rooftop panels and a low tech brise-soleil facade that is optimized in terms of orientation. With more rain projected in the future the roofs and plaza surface would have a porous structure which would contribute to the surface water management.Cycling would be promoted through linking the building with surrounding bike lanes but permitted only in specified areas. A bike storage would be accessible from the street level.